Toyota hasn’t built an exciting car in quite a while. The Supra stopped production in 2002 but stopped exporting in 1998. Since then it’s been big and bland for Toyota in the United States. Lexus wasn’t exactly setting race tracks on fire either, although the original IS caught a lot of sporting-esque people’s attention (but it wasn’t a sports car, just cool-looking). Then in 2009 (at the height of new Nissan GT-R-mania), Toyota announces this insane car that they were going to build. Will it be the next Supra? Nope – it’s going to be a Lexus – and a $400,000 one at that. Needless to say, this was rather shocking. Lexus began taking deposits and chose their customers (instead of the other way around) – as only 500 cars were going to be built (and were: production started in December of 2010 and ran through December of 2012). They were all built-to-suit. Strangely, these cars were sold through a two year lease program – that is, Lexus had first rights to buy the car back should the owner choose to sell it. I guess they didn’t want this one, as it’s about to be auctioned off. 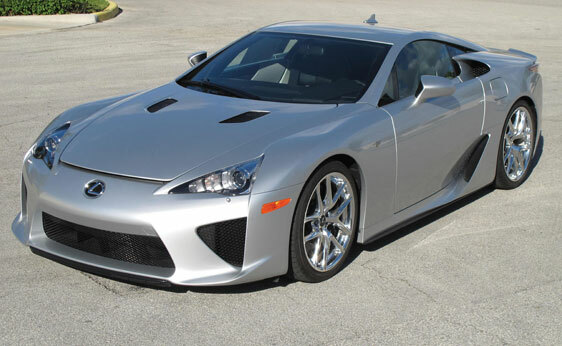 With a base price of $375,000 (for the base model, which this is), Lexus only sent 150 LFAs to North America. The car uses a 4.8-liter V-10 making 552 horsepower. It sounds like an F1 car (no doubt, something Toyota learned from their V-10 F1 experience). The car is packed full of technology and drives and handles like a dream. It really is an astounding car. It is a purpose-built supercar – the purpose here being one of the following: to show Toyota can be fun and build something awesome; for Toyota to show their shareholders that F1 was a semi-worthy investment; to better the GT-R (debatable); to make as many people as possible go “Whaaat?” (accomplished). With only 150 reaching these shores, they’re certainly rare and already out of production. As the two-year lease program has yet to expire, this is a rare, early opportunity to acquire one. This one has 400 miles on it and is essentially brand new. $350,000-$400,000 is reasonable. Click here for more and here for more from Auctions America. This entry was posted in Uncategorized and tagged 2012, auctions, auctions america, lexus, lfa, sports cars, supercars by ClassicCarWeekly. Bookmark the permalink.